Later this year The Dailey Method Eastown will celebrate its two year anniversary and during that time I’ve become one of their unofficial super fans. I made the commitment a little over a year ago and never looked back! To read more about why I love it there and why you might too, I’ve written more about that here. But this post is designated to ‘What to Expect’ from your first class at The Dailey Method because if you’re anything like me it’s nice to have an idea of what you’re getting yourself into before taking the plunge! Signing Up (I recommend ‘Dailey Cycle’ for first timers) - Once you’ve signed up online or by using the free app on your phone, here’s what to expect on your first day of Dailey Cycle, one of my favorites! Dailey Cycle fuses body sculpting and flexibility - both are big aspects of The Dailey Method fitness offerings. The Dailey Cycle format blends 40 mins of heart pounding cycling followed by 20 minutes of upper body toning and core strengthening in the barre room. It’s a balanced, full body workout and a great place to start for your first class at TDM. You’ll get to see both the cycle and the barre room all in one shot. What to Wear - First, wear what you’re most comfortable in and something that’s breathable. You’re going to work up a full sweat on the bike despite the amazing fan system. Most cyclers wear long, tight fitting workout pants and a dry fit top. Some do wear actual biking shorts, but again, most wear long pants. Do NOT wear pants that are loose fitting to avoid getting tangled on the gears and pedals. I also recommend having a long sleeve layer on top of your tank or t-shirt… it’s nice to begin class in especially if it’s cold outdoors and as you warm up peel off the layer. TDM does provides cycling shoes for you and the cost is included in your class fee, bonus! But don’t forget to bring/wear your socks. Barefoot is a no go. What to Bring - Don’t forget your water bottle. Each bike has a spot for your water bottle to rest during class for an easy to grab refresh. There is also a water fountain with a water bottle refill spout. For the barre room you’ll need socks with grips on the bottom. No shoes are allowed in the barre room. TDM sells socks there (they are never out of stock!) and they come in all sizes and colors. Worst case you forget them… TDM has you covered, there’s a loaner bin of socks just in case. Also, if you’re a fitness tracker… don’t forget your Apple Watch! I LOVE tracking my classes. I’ve never seen higher calorie burns or heart rates than I do at TDM. What is Provided - As mentioned before, TDM provides cycling shoes! Why? Because they believe you get the BEST work out when you’re fully part of the bike. There’s no extra cost for the shoes and they’ve got all sizes. They also provide towels (times two! 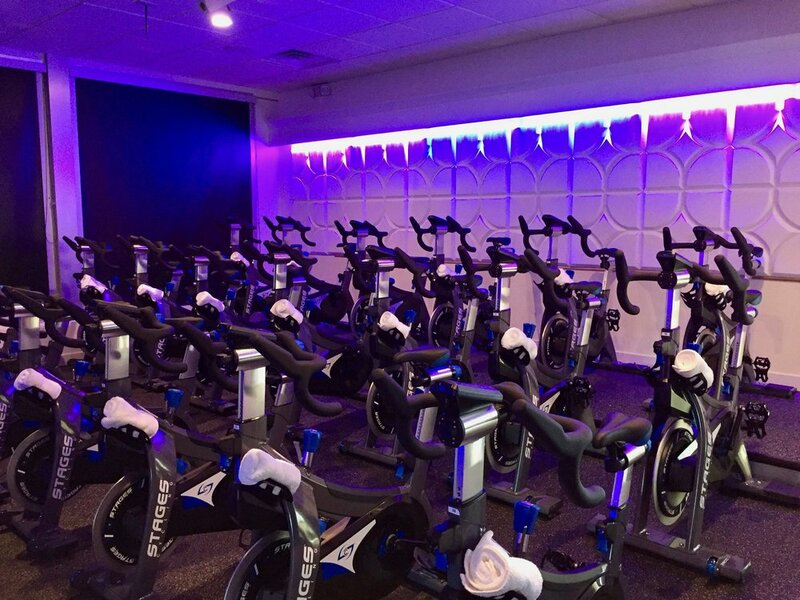 ), once at the beginning of cycling class to use throughout your ride and a second (this time chilled with amazing scents) just after the spin portion is complete while you transition from room to room. They must have an amazing washer and dryer because the towels are always pristine white! Once you enter the barre room you will find that the instructor has already laid out the gear you will need for that class. Items you’ll find always include a mat and most often weights which you can change out as desired. Most go with the pink weights which are 2 pounders. Other gear might include an orange strap for stretching, a green fitness ball and sometimes an elastic strap for added resistance. Getting There - If you’re familiar with the area, TDM Eastown is located where the old Striders used to be. It’s directly across the street from Harmony Brewing (which is both awesome and dangerous) and they have an easy to access parking lot so no worrying about getting a spot on the street. You can also find the address on their contact page. Also, if you’re coming from work or elsewhere (or heading somewhere after your workout) TDM has a full women’s locker room with a shower plus a separate individual (unisex) shower room. The Dailey Method Eastown on Wealthy Street. When to Arrive - If it’s your first time, I recommend arriving 10-15 minutes prior to class starting. This will give you time to check in on the iPad, figure out your shoes size and get connected with the instructor. The gals at the front desk are extremely nice and after a few classes under your belt they’ll be greeting you by name and handing you your appropriate shoe size upon arrival! Unless you’re an expert cyclist (I certainly wasn’t) it’s a great idea to have the instructor give you the low down on the bike. They’ll help get you sized up and show you how to adjust your seat and handle bars as well as figure out how to clip your shoes in while getting on and off the bike - I still have trouble sometimes. Everyone does. They’ll also show you how to change gears and turn the blue resistance knob up and down. The Dailey Method Eastown Lobby. During Cycling Class - In Dailey Cycle you’ll spend 40 minutes in the cycle room which will equate to about 10-12 songs. First, the warm up, then a group of songs that’ll take on you climbs, sprints and mixed choreography of jumps, lifts, presses on the handle bars and more. The classes are never the same and each instructor provides their own routine and music. But a few things always remain the same: 1. You’ll always begin with a warm up track 2. Closer to the end of the class the instructor will announce ‘moving meditation’ and will turn out the lights completely. This is meant for you to accomplish whatever you like during that 2-3 minutes - I almost always do a standing climb at gear two. And 3. Class will end with a cool down and most often a few stretches before transitioning to the barre room. Head up, throughout class all of the instructors will periodically get off, and back on the bike and don’t be surprised if some walk through the isles between you! The Dailey Method Eastown Cycle Room. During Barre Class - All the gear (minus your grippy socks) will be set up and ready for you. Since you focused on legs in the cycle room, the barre room will round out your workout with arms and abs. The instructors in the barre room walk around almost constantly after demonstrating the move that comes next. Over the next 20 minutes they will guide you through the moves and stretches and finish your workout with a moment of pure rest. They are there to offer assistance as needed and don’t be surprised if they correct your posture a time or two - barre exercises are pretty precise so posture is key! The Dailey Method Eastown Barre Room. The Dailey Method has been a game changer for me and if you’re searching for something new, this could be it. TDM runs new client specials for $79 that includes 3 full weeks of unlimited classes. Join me! The Dailey Method Eastown instructors.